Thus far in this marathon, I've watched movies that many people have seen and enjoyed, but they usually don't have such avid fans. That changes this week with Pee-wee's Big Adventure, which it seems like nearly everyone but me watched as a kid. Paul Reuben's iconic character is still present today and makes appearances on Late Night with Jimmy Fallon and even on the Rachel Ray show. Pee-wee didn't originate with this movie and goes back more than 30 years. Let's get to the questions and see if I agree with his continued popularity. 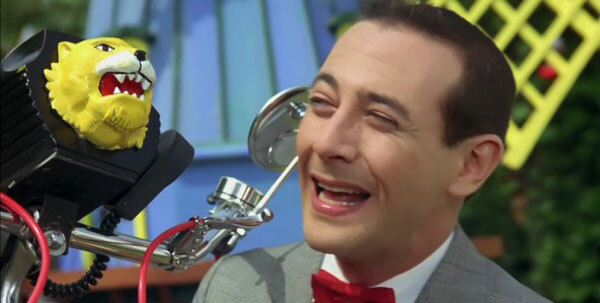 Pee-wee Herman (Paul Reubens) has a happy life. He lives in a crazy, gadget-filled house and has the greatest bike in the world. The cute bike-store worker Dottie (Elizabeth Daily) has her eyes set on him, though he barely sees it. 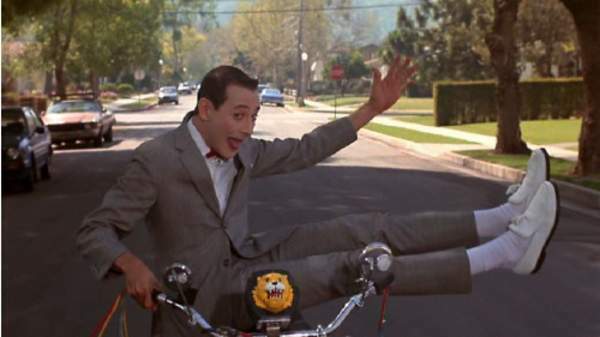 When his precious bike is stolen, Pee-wee’s life is thrown into utter chaos. He embarks on a journey to find it and has a series of fun adventures with oddball citizens across the country. This trip takes Pee-wee to the Alamo, a biker bar, and all the way to Hollywood by various modes of transportation. Traveling by car, train, truck, or motorcycle (briefly), nothing will stand in his way. It's a mystery. I can’t really figure out why I never saw this movie as a kid. Catchphrases like “I know you are but what am I” were common among the kids I grew up with in the mid-80s. It seems like required viewing for anyone who grew up during that decade. This wasn’t a case where I watched parts of the movie but just missed catching it from start to finish. With the exception of the famous “Tequila” scene in the biker bar, very few scenes stood out to me. This was nearly a brand-new experience, which made it a lot more entertaining. I’ve caught episodes of Pee-wee’s Playhouse as an adult (a local bar used to show them), and the character does pop up frequently in other pop-culture areas. That said, it was still different to watch him in the context of a feature film. Pee-wee’s Big Adventure is one of those comic gems from the’80s that doesn’t feel completely tied to that decade. Unlike some popular recent movies that already feel dated, its madcap sense of fun remains today. The overall look places it in 1985, but Pee-wee’s adventures could take place in a variety of time periods. Much of this success is due to Tim Burton, who already displays a unique style in his directorial debut. There’s plenty of creativity on display from the start, and that keeps the material from becoming stale more than 25 years later. The simple plot (looking for a stolen bike) allows Burton to focus on the inventive set pieces, which remain highly entertaining today. The characters are believable in this film's world, though most aren’t presented with much depth. Even the love interest Dottie has limited screen time. 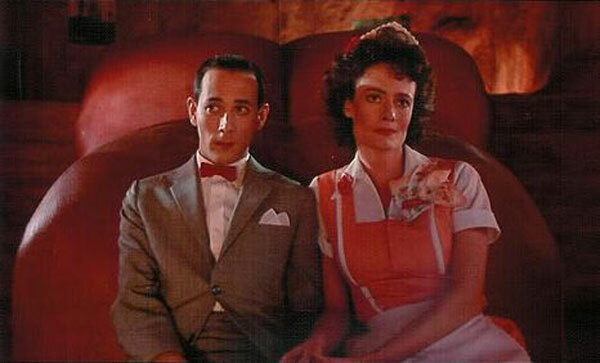 Pee-wee appears in nearly every scene, and the other characters just play a small role in his world. Your enjoyment of this movie will completely depend on your tolerance for the main character. I was surprised by how much I liked the quirky character, who’s brought to life effortlessly by Reubens. One of the highlights is seeing him interact with such a wide spectrum of colorful people along the way. 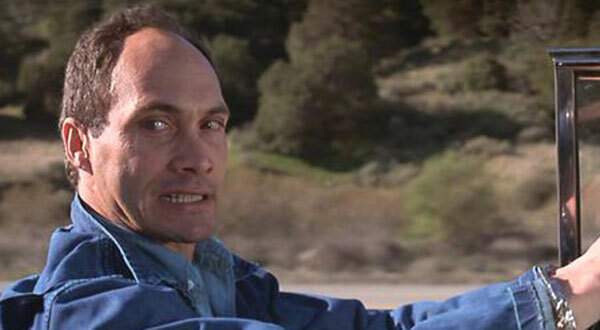 A good example is the escaped convict Mickey (Judd Omen), who picks up Pee-wee while he's on the run from the law. The performance is way over the top, but it matches Reubens’ manic role and makes them a great comic duo. There are plenty of great moments in this fast-paced movie, which is basically a collection of episodes of Pee-wee meeting odd characters. One highlight is the tour of the Alamo, with Jan Hooks playing an overly cheery (and frightening) guide. I knew about the biker bar dance scene in advance, but it still was good fun. The best moments occur during the final act with Pee-wee taking a mad dash on his bike through a wide array of soundstages on the Warner Brothers lot. The chase disrupts a Christmas scene, a Japanese monster movie, and even a Twisted Sister music video. Security guards pursue him through every set, which leads to an inspired use of a personal favorite trick involving a fake backdrop. Brilliant! Finally, the Hollywood adaptation of Pee-wee’s life (starring James Brolin and Morgan Fairchild) is a classic moment, especially during his cameo as the bellhop. I’ve enjoyed each choice from this marathon so far, but this was the biggest surprise. I expected that it would involve Pee-wee getting involved in fun hijinks across the country. What I didn’t anticipate was its charming take on the movies, especially during the final act. I haven’t mentioned Pee-wee’s encounters with a hobo who likes sing-along songs a bit too much or his encounters with a waitress who yearns to go to Paris. He’s basically meeting characters from a variety of different movie genres, all packed into one movie. 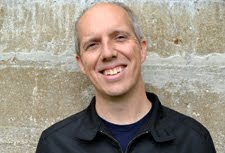 It’s a fairly-tale land where even the nasty people like his rich acquaintance Francis (Mark Holton) are toothless. A world where tough-guy bikers can be charmed by a skinny guy dancing to “Tequila” is a place I’d like to visit. Pee-wee’s childish glee fits within this environment and helps to create a fun, original film. Another one of my favorites from childhood. Interesting that you make note of the film's charm... makes me want to go back and revisit it! Alex, I think a lot of people have fond memories of this movie from childhood. It's definitely a different experience seeing it as an adult, but there's still a lot of cleverness in it. Thanks! Not really one of my favorites, but a pretty fun movie... and one that reminds us of a time when Tim Burton wasn't hopelessly stuck in a rut. Martin, I agree that it's cool to see Burton when he was a lot more creative and not just putting Johnny Depp out there for a remake. I wouldn't call Pee-wee a new favorite like you say, but it was a lot of fun. Thanks!